PHARR — After a few weeks of presentations, indecision and complaints of lack of information, seven out of 42 Pharr-San Juan-Alamo school district campuses voted in favor of moving forward with an attempt to implement a charter-like partnership. Teachers district-wide drastically turned down Superintendent Daniel King’s proposal during a vote Thursday afternoon, which yielded a total of 661 votes in favor and 1,448 opposed. 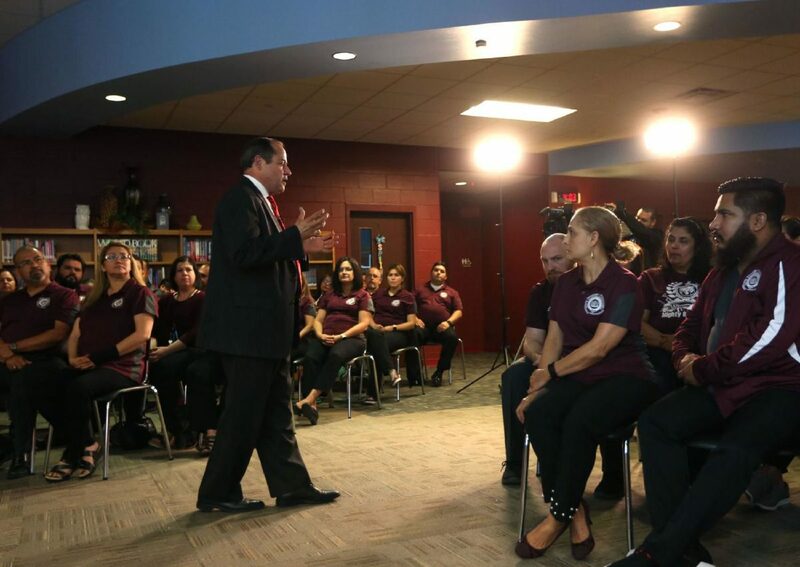 Each one of PSJA school district’s 43 campuses held a vote in which teachers, librarians, counselors, registered nurses, collaborative learning leaders, collaborative learning facilitators, instructional coaches, deans of instruction, assistant principals and principals were asked whether they wanted their campus to adopt Senate Bill 1882. The votes were counted that same night revealing six elementary campuses — Anaya, Chavez, Doedyns, Garza, Sorensen and Livas — as well as Sotomayor Early College High School in favor and one tie at Cantu Elementary. The next step, King said after the vote, is to present the full results to the board of trustees to decide whether to move forward with the application for those campuses that voted in favor. If approved by the board, the proposal then goes to the Texas Education Agency for final approval before it can be implemented. King stated again, however, that as per his initial commitment those that voted overwhelmingly against the measure will not be considered for the program. As per King’s proposal, dubbed EmpoweredED, the adoption of the bill is aimed at giving these staff members, especially teachers, increased say-so in campus matters by partnering with charter-qualifying nonprofits, which would be contracted to guide the process. Through this partnership, King said the estimate is that participating campuses might qualify to receive up to $906 per student annually in additional state funds, or $28 million per year if it was to be a district-wide move. SB 1882, passed in 2017, was intendent to allow districts to partner with public charter schools or other charter-qualifying institutions to give up operational control of underperforming schools that were about to be sanctioned by the Texas Education Agency. These schools would in turn receive two additional years free of sanctions and — in hopes of turning them around — their funding would increase to match that of a public charter school if it was below that line. The bill also allowed for innovative partnerships in which school districts could request to form similar partnerships to implement innovative programs within a campus and receive more funding. King’s proposal was aimed at this type of use, but his plan was to ask TEA for flexibility with some of the rules. His goal, he said, was not to completely give up operational control, but to have these partners, which he called Innovative Management Organizations. Moving forward with the proposal, however, was dependent on teachers’ decision, as King committed to this initial approval stage even as it wasn’t required by the bill or TEA’s rules. And some teachers voiced their concerns over the possibility of these outside entities gaining full control over the campus, believing the move as a step toward privatization of public school districts. King said he will first report the outcome to the board to give trustees time to review it, then the proposal will be voted on at a later date, which had not been decided as of Thursday evening.